Red Alert. Zombies on TV. This is a test of the American Broadcast System. Finally the small screen is getting the zombie picture with the new Walking Dead series on AMC. 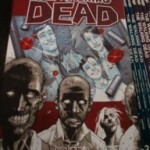 It’s based on the comic created by Robert Kirkman and Tony Moore. Great tips on how to survive a zombie apocalypse which, if you are even a bit suspicious about secret government tests in chemical warfare, can’t be that far in the future. I don’t care how you think zombies are made, it all comes down to the same thing: someone or some group trying to control someone else or some other group. The game is always the same: Survival. 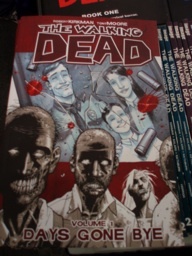 In this case, Rick Grimes, a small-town police officer from Cynthiana, Kentucky, is stuck in a world full of zombies. This should keep the dead up nights.